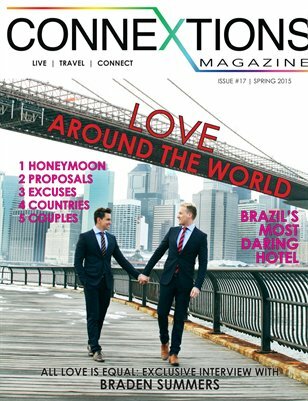 Connextions Magazine, the LGBT Travel and Lifestyle Magazine celebrates "Love Around the World." Featuring: Exclusive Interview with Photographer Braden Summers, Brazil's Most Daring Hotel, a Chicago "Road Trippin' adventure, a New York City Scavenger Hunt/Proposal, a Mexican Honeymoon, Venice, Italy and more! Also, special report on HRC's Greater New York Gala.